The standings remain the same after 8 weeks of football competition in the Premier League of Belize (PLB) Belikin Cup Opening Season 2013-2014, after all 3 games played resulted in identical 1-1 scores. This past weekend’s games were the Week 5 backmatches, and all were played yesterday, Sunday, December 1. The Week 7 backmatches will be played this coming weekend. Out west at the Norman Broaster Stadium, late surging San Ignacio United almost accomplished back-to-back upsets of “big teams,” as they led Belize Defence Force FC by a 1-nil score, off a 29th minute goal by Carlos Vasquez, until late in second half. It wasn’t until the 89th minute that BDF got the equalizer from Khalil Velasquez, to salvage the 1-1 draw. Down south at Toledo Union Field, goals were just as scarce, as the star studded Police United FC team is still struggling to score goals. Home standing and still league leading Paradise/Freedom Fighters struck first, with a goal from Alexander “Pleck” Peters at the 85th minute; but Police responded one minute later with a goal from Bernard Linares at the 86th minute, to secure the 1-1 draw. Here at the MCC Grounds it was another low scoring affair, but there was indeed history in the making in this one, as it saw the legendary Norman “Tilliman” Nunez rekindle memories of his awesome striking days with what may well be his last goal, at the 8th minute, on the MCC; while 17-year-old rookie, Devaun Zuniga, who was but a twinkle in his mother’s eye when Tilliman had already won his first championship, scored his first semi-pro goal, at the 15th minute, to equalize the score for his team. Despite the pathetic state of the MCC turf, it was a beautiful game indeed, with fans on the edge of their seats for the full ninety. It was two very good teams executing their game plans, and with many heroic efforts on both sides. 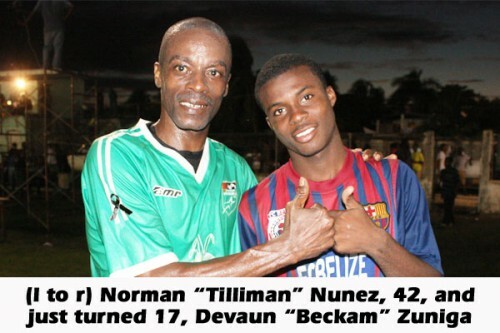 With all the pre-game hype surrounding the return of the veteran, former super-striker Tilliman to the MCC, it was a given that the FC Belize brain trust, under new coach Fred Garcia, Jr., assisted by Jorge Nunez, would give special attention to Tilliman, to avoid him having space to create attacking plays; and they were very effective in doing that, muscling him off the ball, fouling him occasionally, and generally forcing him to touch the ball only once on most occasions. With two veterans, Tilliman and Orlando “Leechi” Jimenez in the central midfield for Verdes, the younger legs of the FC Belize outstanding young midfielders commanded more of the possession; but Verdes coach Pascual Noralez stuck with Tilliman through the full ninety, and he remained a concern for FC Belize, although the heavy, soft turf perhaps helped to detract from the effectiveness of both Verdes veterans. Outstanding for Verdes were also Evral Trapp on left midfield and Orland Lyons on right defense. Young Nahjib Guerra, who entered the game as a striker early in second half, showed some tenacity and skill in offense also. A number of on-field adjustments were made, as he replaced left defender Eduardo Gongora. And there is no denying the work put in by right midfielder Jacinto “Fowl” Bermudez and strikers Julio Ayala and, unusual for the position, Ricardo “Cheety” Jimenez. Rodney Pacheco and Victor Cruz made a tough pair down the middle of the Verdes defense. Gilroy “Bredda” Thurton, who replaced Jacinto at the 35th minute of first half, couldn’t find his footing on the soft MCC turf, and was soon frustrated by the tight marking, until he ended up getting ejected with consecutive yellow cards by referee Irfan Basdemir late in second half. But the story of the game, aside from the spectacular blast at the 8th minute from Tilliman, off a center on the ground from right midfielder Evral Trapp to the top of the eighteen, to give Verdes the 1-nil lead; and the equalizer 7 minutes later by rookie Devaun Zuniga, after Jorge Alexman’s high center from the right wing saw some confusion in front of the Verdes goal, and Zuniga was the man on the spot to drive home his first semi-pro goal; despite all that, great mention must be given to the sterling and exciting play of FC Belize midfielders Kevin Lino and Jorge Alexman, and their other striker, Travis Eiley, whose explosive speed and remarkable poise under pressure, kept the Verdes defenders on their heels for much of the game. Key to FC Belize’s plan was also the deployment of all-around talent Jarret Davis in midfield to further stifle the ball movement of the veteran Tilliman; and Shannon Flowers was also outstanding in defense, as were Jorge Estrada on the left, “Best Defense” Leon “Chow” Cadle and powerful stopper Luis Arriola. Both goalkeepers, Glenford Chimilio for FC Belize and the veteran William Luna for Verdes, put in some fine work yesterday. Eiley’s right-away rocket in second half rebounded off the Verdes crossbar; while second half insert Marlon “El Matador” Meza unleashed a right foot blast that almost got away from Chimilio, who made a spectacular diving save. There is so much that was interesting about yesterday’s game at the MCC; it will probably be discussed for some time. FC Belize certainly brought something exciting to the table this week, and with the blossoming of their young midfielders and strikers, they may be a team to watch down the stretch of this very tight season. For his part, the veteran Tilliman has done it all, again, and seems pleased and appreciative of the young talent that he sees attempting to walk on the road he has travelled. At 42, to play a full ninety at the top level and still be considered worthy of tight marking till the end is itself an achievement; to score is indeed icing on the cake. Football fans who were at the MCC yesterday can say they experienced history in the making – the glorious past ushering in the bright and promising future.